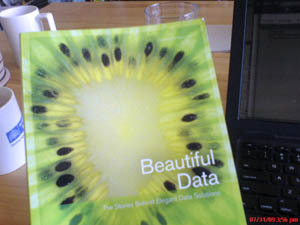 My first copy of Beautiful Data arrived in the mail today. This is the first bound-and-printed book-looking thing I've been a part of, thanks to an invitation from Toby Segaran and Jeff Hammerbacher. 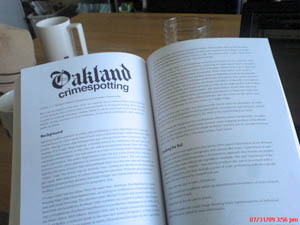 I'm in the middle with a chapter on Oakland Crimespotting, straddling the color plates and tucked in amongst such luminaries as Jeff Jonas, Aaron Koblin, Jeff Heer, Nathan Yau, Peter Norvig, and others. The book available now from O'Reilly and Amazon. Author royalties from the sale of this book are being donated to Creative Commons and the Sunlight Foundation. Congrats, having skimmed the PDF looks awesome.